The installation is in the reverse order of the removal. However, when there is a special point concerning the installation, it is indicated. On the RH side, use the same procedures as on the LH side. (a) Cover the circumference of the moulding with protective tape for protection. 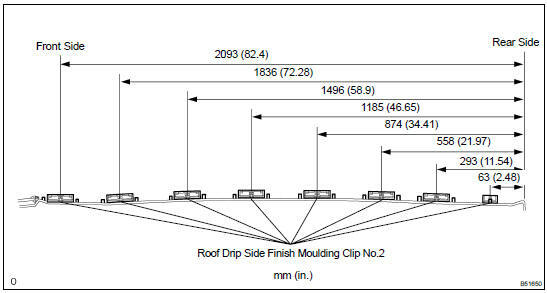 (b) Using a remover for the roof moulding, release the engagements of the clips in both front and rear ends of the moulding, and then remove the moulding. Do not remove the clips. In case that the clips are damaged or removed accidentally, exchange them for supplied ones. NOTICE: Only when exchanging the clips. (a) Remove the adhesive tape that remains on the mounting surface of the body, and then clean the surface with white gasoline. (b) Using a heat light, heat up the clip installation surfaces of the body and moulding. NOTICE: Do not heat the body and moulding excessively. (c) Set the supplied clips into the positions as shown in the illustration, and press-fit those clips by hand to install them. (d) Install the moulding when 30 minutes or more have passed after press-fitting the clips.